Summary 3x3 AC1900 class router with Gigabit Ethernet ports and USB 3.0 storage and printer sharing. Not a "tri-band/radio" AC3200 class router. 'Tis the season for wireless router makers to roll out new stuff to ask Santa for. Actually, it's more to satisfy the yawning retail maw of Best Buy, Amazon, et al., but I digress. The WRT3200ACM doesn't reach as far as the Talon in its attempt to puff itself up into something it isn't. But by branding itself as "AC3200" class, most buyers will believe they are buying a Broadcom-based "Smart Connect" 3x3 dual-band router with two 5 GHz radios. You're not. What you're getting is a Marvell-based dual-band 3x3 AC1900 class router with one 5 GHz radio that supports contiguous 160 MHz bandwidth. The Maximum link rate math works out to 600 Mbps (2.4 GHz) + 2600 Mbps (5 GHz) = 3200. Read How To Buy A Wireless Router - 2017 Edition for more on 160 MHz bandwidth. Getting the 5 GHz 2600 Mbps maximum link rate requires a 3x3 client that also supports contiguous 160 MHz bandwidth. 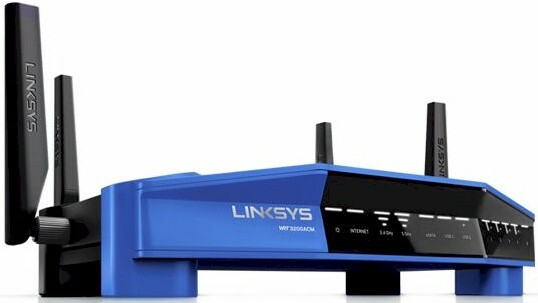 The only device on the planet that currently can do that is another WRT3200ACM in wireless bridge mode, which is what Linksys sent for testing. With plain ol' standard 802.11ac devices that support only 80 MHz wide channels, maximum 5 GHz link rate will be 1300 Mbps, the same as other 3x3 AC routers. So with 600 Mbps in 2.4 GHz and 1300 Mbps in 5 GHz, you get 1900 Mbps, which is how I'm classing the WRT3200ACM. The WRT3200ACM sticks to the WRT family playbook and can be easily mistaken for the WRT1900AC or WRT1900ACS, right down to the front panel lights and rear panel connectors, including the unusual eSATAp port. Those reviews have the details, which I won't repeat here. FCC short-term confidentiality expires at the end of this month, but I'm doing the review right now. So I had to open one of the review samples after testing was done to take photos. The first photo shows the board assembly after removing the plastic case and with all heatsinks in place. The processor, switch and RAM are under the big heatsink on the left. The 5 GHz radio is in the middle and 2.4 GHz radio at the right. Both radios share four external dual-band antennas that connect via RP-SMA connectors. Here's the view with all heatsinks and RF can tops removed. The small device at top center is the 5 GHz DFS monitor radio in the form of a Marvell 88W8887-NAA2 WLAN/Bluetooth/NFC/FM Receive Single-Chip SoC. Its antenna sits close by, behind the middle LED bank (connected via the short green cable). The bottom of the board reveals two Micron 128 MB DDR3 chips, one for each of the Marvell 88W8964-BTW2 radios. Like the WRT1900AC and ACS, the WRT3200ACM is a three-stream AC router using four transmit / receive chains. The WRT1900's use Marvell 88W8864's for both radios; the WRT3200ACM uses the 88W8964. Here's a photo of the WRT1900ACS board top for comparison. The 88W8864 data sheet states "4x4 MIMO 3-spatial Stream Dual-band 802.11ac offering 1.3Gbps WLAN PHY rate" (emphasis mine). That is pretty clear. But the 88W8964 data sheet doesn't state the number of spatial streams, instead opting for the vaguer "4x4 MIMO Dual-band 802.11ac Wave-2 solution enabling 2.6 Gbps WLAN PHY rate". But the 2.6 Gbps doesn't refer to the total link rate of a standard 4x4, four-stream design. Instead it refers to only the maximum 5 GHz link rate made possible when the contiguous 160 MHz bandwidth mode is used. Got it? Fortunately, Linksys was very helpful in sorting all this out and gave direct answers to my questions. The WRT3200ACM's key components are in Table 1. I included the WRT1900ACS and the only other router that supports 160 MHz bandwidth, NETGEAR's R7800, which supports 80+80 mode.